Iron-on transfers for hand embroidery are a fast way to get your design onto your fabric so that you can begin embroidering right away. The magazines are called Mains et Merveilles, and yes, they’re in French. However, even if you don’t speak a lick of French, if you’re looking for nice iron-on designs with clear instructions, these are the books for you! There are five issues that I can find readily available in the States and that deal with different types of surface embroidery: one on cutwork, one on household linens, one on baby items, one on flowers and animals, and one on embroidered initials with all kinds of embellishment. Not only will you find color photos instructing you on stitches, but you’ll also find hints on fabric set-up and other useful points of embroidery. Worried that they’re in French? Don’t be! The photos give clear instructions – and, if you really get stuck, you can type the words into a free online language translater. 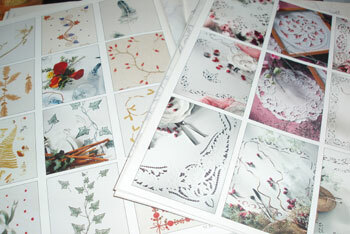 The thing about these magazines, though, is the magnificent selection of classy, beautiful patterns for hand-embroidery. And they’re all tucked right into the center of the magazine, full size and ready to iron-on. 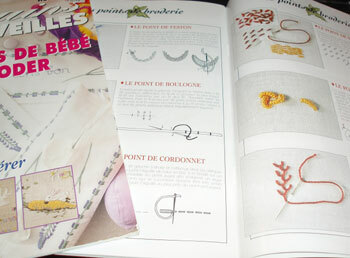 I live in Germany and there are some italian needlework magazines that has the same catastrophe as these french ones. I love the projects and photographs. If one has experience with the techniques, it would be easy to reproduce the projects, without worrying about the language. Yes, the Italian books are excellent – Mani di Fata produces really good ones! They have some beautiful books on curtains ("Tende") which have very nice projects in them, and the language barrier is fairly nil, considering the abundant photos. I am unable to find the French magazines in your article. Any help from you would be appreciated. My sister told me about your wonderful website–the tutorials are so helpful! I went to hedgehoghandworks.com, looking for the French magazines Mains et Merveilles, but was not able to find them–any idea where they might be purchased? Thanks! I recently purchased 2 iron on patterns from your company and I only have attempted to use one. I was very displeased with the way the pattern transferred, some of the lettering was not even visible. 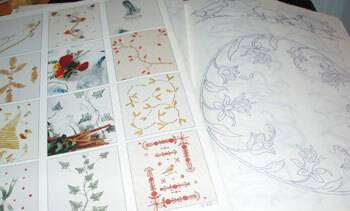 I have stamped off 100’s of Aunt Martha patterns and never had any so dim as not to be able to see. What would you suggest is wrong before I attempt to do the other pattern. These patterns are for baby quilts for infants who pass away and are given to our local funeral homes. Hi, I don’t sell iron on transfer patterns and never have, so you might need to search further for the company you’re looking for.